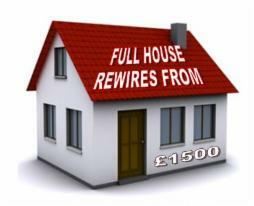 In need of a House Rewire ? Does your cable look like this? if so you need a house rewire. If your house needs rewiring then we can provide very competitive quotes for you in order that it can be done as cleanly and efficiently as possible. We specialise in Gloucester house rewires and also Cheltenham house rewires. A house rewire is a major job, but if the wiring in your house is old or inadequate, a house rewire would be an urgent safety matter. The first thing to check is the colour of the cables - if you find black coloured cables entering the consumer unit, this is an immediate sign that the wiring needs checking. Modern electrical cables are either grey or white and are insulated by a coating of PVC - the old black cables were insulated with rubber, which perishes and decays with age. 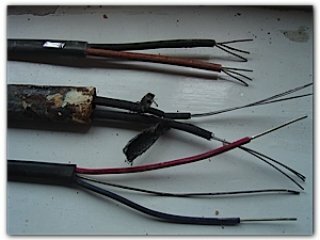 Black, rubber coated wires could be up to 40 years old, and over the time the deterioration allows the conductors inside the cable to meet. This will manifest itself as a blown fuse (short circuit), but if you replace the fuse it will simply blow again and there is a real danger that the cable will catch fire. The only solution is to replace the wiring. Do any of your sockets or plugs heat up fast or have burn marks? Modern houses place a much higher demand on the electrical system than in years past, so if you have antiquated wiring it is an accident waiting to happen. Even if the safety issues aren't enough to persuade you, you will have to get your electrics updated before you sell your house - a basic inspection will reveal inadequate or defective electrics, and no mortgage lender will lend money on a house that could burn down in the near future! If you have concerns that your electrical system is either inadequate of too old, it is essential to get a qualified electrician to look at it. This is not a job for an optimistic amateur. Indeed, with the government's new IEE Wiring regulations in place, there are strict limits to the work that you can do yourself. Full and partial house rewire. Electrical testing with NAPIT certification. All of our house rewires come with full NICEIC certification. We are fully certified member of the NICEIC and are qualified PART P installers. 10 year guarantee on all house rewires. We offer a ten year guarantee on all the full house rewires we do, unfortunately we can not offer such a long guarantee on partial installations.